Ascites is a medical term used to describe the accumulation of the fluid in the peritoneal cavity which leads to the abdominal distension. Generally, a severe liver cirrhosis and heart failure is a common cause for this disease. It must be cured in proper time otherwise it may lead to severe complications. In this condition, the fluid secreted by the liver is exceeded on large scale and the abdominal cavity is distended with such fluid. WHAT ARE THE CAUSES OF ASCITES? Depending on the accumulation of fluid and the level of water, the causes may be described in 3 ways. The most common type of Ascites is SAAG is due to the high Serum Ascites Albumin Gradient (SAAG). It is transudate in nature which means that the fluid which passes through the membrane filters out of the cells and there is much proteins yielding watery solution. It has considerable low proteins. It is caused due to viral, cryptogenic or alcoholic cirrhosis, heart failure and veno-occulsive disease. 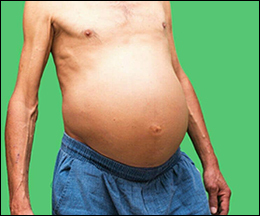 Another type of ascites is caused due to low SAAG, in which a fluid with high proteins and cellular debris including pus cells, blood, plasma protein, white blood cells and platelets may be present which escapes from the vessels and gets deposited in tissues. It has considerably high proteins. It is mainly caused by carcinogenesis, disease like pancreatitis, tuberculosis, nephritic disease. Other rare causes are thyroid disorder, dialysis and vascular disorder. Obstruction in sweat and water carrying system. There are 8 types of ascites (jalodara) described in Ayurveda due to vitiation of Vata, Pitta and Kapha doshas in the body and due to liver and spleen disorders. WHAT ARE THE SIGNS AND SYMPTOMS OF ASCITES? During the pressing of abdomen on one side, it will generate a wave like movement through the fluid which can be noticed on the other side. Dilated veins on either side of the abdomen. Various tests such as complete urine examination, ultrasound examination confirm the diagnosis. Planet Ayurveda offers best effective remedies for Ascites. It may be cured through herbal remedies without dialysis or tapping if the treatment is started in early stage. 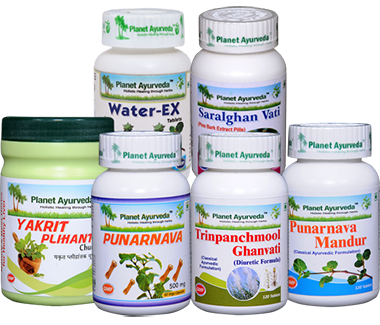 Punarnava Capsules are very helpful in ascites as it is very helpful in water retention. It helps in the elimination of excess fluid in the abdominal cavity through urine. It is a safe herbal supplement for the patients suffering from ascites. These capsules help in reducing swelling and inflammation in a natural way. It has diuretic properties and supports the body's ability in removing fluids. Thus, this herb is better than most of the diuretics available in the market. Punarnava Mandoor tablets are used in various health conditions such as they are used to improve blood count, for removing toxins from the blood, help in decreasing urea or creatinine, cholesterol and toxins from the blood. These tablets are very useful for the patients suffering from ascites, liver failure, fluid accumulation, puffy eyes, anaemia, fatty liver and many other problems related with accumulation of fluid in the body tissues. As the name suggests, Water Ex-tablet is a unique herbal formulation for the patients suffering from water retention. These tablets help in handling excess of fluid retention in the body. These tablets are natural and safe way to manage the problem. Tripanchmool Ghan Vati is an Ayurvedic medicine frequently used for relieving urinary tract infections, scanty urination, water retention due to any cause. It reduces vitiated Pitta in the body. It consists of extract of five grass roots. Tripanchmoolghan Vati eliminates excess water and toxins from the body without unbalancing the electrolytes. 'Yakrit' means churna and 'Pliha' means spleen. This churna is a unique product of Planet Ayurveda and is a mixture of various herbs that help in improving the liver function. This churna helps in regenerating liver cells as well as improves its functions. 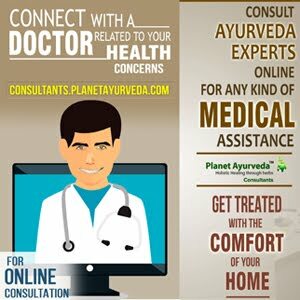 It is a very useful remedy for the patients suffering from ascites as it is a mixture of wonderful herbs formulated by Ayurvedic experts of Planet Ayurveda. Dose: 1-2 tablespoons twice daily. These tablets are prepared from Saral (Pinus roxburghii). These tablets act as a natural diuretic, useful in inflammatory conditions, improves renal function and beneficial in the diseases of liver and spleen. Avoid alcohol, excess use of salt, excess starch food products like rice, wheat, potato, milk derivatives, fast foods. Various digestives such as cumin seeds, black pepper, chitrak, ginger should be included in the diet. How To Treat Ischemic Heart Disease Naturally?